Samsung wowed us when it unveiled the Gear S2, a fully circular Tizen-powered smartwatch with a nifty rotating bezel. It was impressive at first glance, but how about after a week of use? Our Samsung Gear S2 review will run you through the performance, software and specs of the standard and Classic models, to see if this smartwatch is good enough to make you switch to Tizen. The Samsung Gear S2 release date in the US was October 2, 2015. The Gear S2 price depends on the model: the basic model (Gear S2) costs US$299, the Gear S2 Classic sits at US$349. The 3G-enabled Gear S2 works with Verizon, T-Mobile, AT&T and US Cellular, and prices start at US$359.99. The Samsung Gear S2 actually comes in three different versions: the standard Gear S2, the Gear S2 Classic and the Gear S2 3G. Our Gear S2 review focuses on the regular, sporty-looking Gear S2, and the more traditional-looking Gear S2 Classic. The Gear S2 3G looks the same as the standard Gear S2. On the inside, all three devices are basically identical, except that the Gear S2 3G has an e-SIM and speaker for making calls, GPS, and a 20 percent larger battery than the others (300 mAh vs 250 mAh). All variants of the Gear S2 are round, and have two physical buttons – one to go back and one to go to the home screen or launch the app drawer – and a rotating bezel that can be used to navigate the Tizen interface. You can still swipe between screens and menus, but the rotating bezel makes it easier to navigate quickly. It's a really intuitive way to use a smartwatch. Both the Classic and standard Gear S2 are made of metal, but the regular S2 has a two-tone matte finish whereas the Classic is polished. Both watches have Gorilla Glass 3 covering their 1.2-inch AMOLED displays. However, the Gear S2 Classic is designed slightly differently to the standard Gear S2. The main difference is that the Classic model is slightly lighter and a bit thinner than the regular Gear S2, and has more traditional and less sporty looks. For example, the bezel area around the display is much less pronounced on the Classic; it's slightly elevated on the standard Gear S2, whereas it's almost perfectly flush with the display on the Gear S2 Classic. The S2 Classic also has ridges on the edges of the bezel, while the standard S2's bezel is smooth, but both rotate as smoothly as each other. The Gear S2 Classic has a leather strap and buckle with a similar pin-eject mechanism to the Huawei Watch. This means that switching bands on the Gear S2 Classic is easy, and you can substitute any 20 mm band for the one it comes with. Speaking of which, there is a spare, shorter strap in the box for those with thinner wrists. The Gear S2 has a rubber band that pops off just as easily, but you can only fit special watch straps to it. The lug areas are another point of difference between the two models. The Gear S2's are a little bit chunkier than the Classic in order to house the strap connection mechanism. On the back, the Gear S2 has a Gorilla Glass 3 panel with a heart-rate sensor in the middle, and stainless steel case surrounding it. At the very least this means you shouldn't have any concerns about cracking on the back of this watch. Overall, both watches are very well designed and look and feel very accomplished. Both versions are IP68 certified (but you won't want to go putting that leather strap in the water too often) and feature NFC and Wi-Fi. Only the 3G version of the regular Gear S2 has a speaker for making and receiving calls when it is not tethered to a phone. 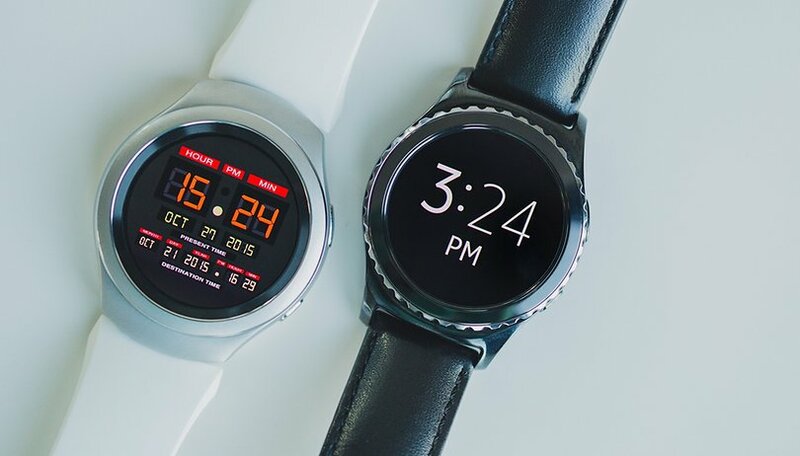 Both the Gear S2 and Gear S2 Classic sync via a Bluetooth connection to your phone and although Wi-Fi works fine on both, there's little reason to use it because it requires more battery power than Bluetooth. The Gear S2 has a fully circular 1.2-inch Super AMOLED display with 360 x 360 pixel resolution, producing a very high pixel density of 302 pixels per inch, although the Apple Watch nudges ahead at 326 ppi. The pixel density is not that much greater than, say, the Huawei Watch (286 ppi), but nevertheless, the Gear S2 display looks great. Black watch faces look exceptional on an AMOLED display (which is also more battery-friendly than an LCD screen), even if they tend not to be as bright outdoors. However, I had no issues seeing the Gear S2 watch face in bright sunlight, and it has 10 brightness settings if you do need to give it a bit of a boost. There are 17 pre-loaded watch face designs and some nice customization options, such as the ability to use a picture from your gallery to create your own watch face design. The screen is surrounded by a very thin on-screen bezel, but it is so thin that it's hardly even noticeable. The benefit of the rotating bezel is that it matches the circular interface of the watch. While you still get the sense of swiping left and right, everything on the Gear S2 is on an arc, so the rotating the bezel actually matches the movement on screen. It's a subtle detail but a nice one. The bezel makes a clicking sound as it rotates, so you're not just spinning it but moving it incrementally. This makes it even easier to navigate long lists or the menus. When you reach the top or bottom of a menu you'll get haptic feedback as well as a glow on the upper or lower edge of the display. The Gear S2 software is Samsung's own Tizen operating system, a fork of Android that Samsung occasionally uses in its wearables. It's a great choice for this device. It simply wouldn't be possible to navigate Android Wear with a rotating bezel simply, because of the up-down, left-right structure of the interface. Samsung's circular interface and nifty navigation are a match made in heaven. There are about a dozen screens on the Gear S2 by default: a notifications area to the left of the watch face and several dedicated app screens to the right (S Health, weather, calendar, heart-rate monitor and so on). There's a swipe-down info screen with a toggle for Do Not Disturb mode and a shortcut to the music player and brightness settings. You can scroll between these screens horizontally using your finger or you can twist the bezel to move much more quickly. It's a very intuitive way to navigate and much faster than clumsily pawing at the screen. The Gear S2 also has two physical buttons. The top one takes you back a screen and the bottom bottom either takes you home from a menu or launches the app picker from the home screen. The Gear S2 has just over two screens of app icons, arranged around the edges of the display. You simply tap the icon you want or rotate the bezel to scroll through them and bring up the app name. You can swipe the screen to jump straight to the next app screen or rotate your way through the apps one-by-one. Your current screen in relation to the total number of home screens or app pages is always marked with a small readout at the top of the screen, so you always know where you are in the OS. It takes very little time to get used to and at no point do you feel as though you're lost in menus. Samsung has done a remarkable job of keeping the interface simple and easy to navigate, despite its complexity. The Gear companion app for Android is pretty decent, offering tweaks to watch faces, app notification controls, Find My Gear, app manager, Gear Apps store, settings, and the ability to simply push media (such as music or photos) to your Gear S2. Tizen is not for everyone and the list of available Tizen apps on the Gear S2 is quite limited. If you have a Galaxy device and are already happy using a lot of Galaxy apps then you might be fine. But if you're a heavy Google app user, switching from Google Fit to S Health, Google Now to S Voice and so on will be a bit of a pain. Fortunately, the Gear S2 is perfectly capable of displaying your app notifications, so you can receive WhatsApp messages (but not respond to them), and Google Now cards still show up right on schedule. The problem arises if you want to add your favorite Play Store apps to your Gear S2, because they simply don't exist for the most part. This is something you need to consider if you're contemplating trying out Tizen. Having said that, the Gear S2 is perfectly usable with the apps it comes with. If you don't have a Galaxy phone, you will have to install a few Samsung apps to get started: the Gear app, the Gear Plugin app and the Gear Accessory Service. If you sign in with your Samsung account you can also use Find My Phone and Find My Gear. A Samsung account also lets you make use of the reactivation lock, so if your Gear goes missing the thief can't just factory reset it and carry on. If you factory reset the watch yourself – and in my case, I had to frequently – you can use the restore option to get things back to where they were pronto. Accessing the settings menu brings some standard fare: a display section covering always-on display, watch faces and brightness, vibration strength, wake-up gesture, a customizable double-press action for the home button, connections (Wi-Fi, Bluetooth and NFC), screen lock, keyboard, power-saving settings and info, which includes reset options. I enjoyed the Tizen interface a lot, but the limited apps was frustrating, because it felt as though I had to largely reorganize my app life. There are more than 1,000 Tizen apps available, but many are location specific, so you can't access them all. This occasionally meant I had to use an alternative to an app I use a lot, or do without it entirely. An addition was made to the Gear S2 firmware in December 2015. Now, if you miss a notification, a small yellow dot will appear on the watch face's nine o'clock marker. It's a small but helpful addition that means you can just swipe to your notifications area when the dot shows up and see what you missed. One thing I must note is that because one of the Gear S2's main selling points is its compatibility with non-Galaxy devices, that is what I used it with. For the majority of the week I paired the Gear S2 with a Nexus 6 running Android 6.0 Marshmallow but also occasionally switched to Lollipop devices to see if that had any effect on the regular connection dropouts I experienced (more on those below). Using a Galaxy or Tizen device will naturally provide a different experience. The Gear S2 will work with any Android device running Android 4.4 KitKat and above, as long as it has 1.5 GB of RAM or more. It is important to note that the Gear S2 works with standard Google APIs for apps such as the dialer and text messaging, so if third-party apps use non-standard APIs they may not work on the Gear S2. Another thing to watch out for. Naturally, Samsung has put a high priority on S Health on the Gear S2, there are health-oriented watch faces and a number of software features geared towards getting you active. On the hardware side, the Gear S2 has a number of sensors, including a heart-rate monitor. All of these work great. The Gear S2 features 24-hour activity recording, auto-recognition of activity type, 'inactivity alerts' for when you're being lazy, automatic heart-rate tracking that increases in frequency during exercise, and watch faces that change to reflect how active or inactive you've been. Other sensors include a barometer, accelerometer, gyroscope and ambient light sensor. The Gear S2 specs include a dual-core 1 GHz CPU with 4 GB of internal storage and 512 MB of RAM. The Gear S2 also features Wi-Fi, Bluetooth 4.1, NFC, and GPS (on the 3G version only). As mentioned above, the the Gear S2 3G features an external speaker and e-SIM, which does not require you to be connected to a smartphone to make and receive calls or access the internet. Samsung Pay is supported by both Gear S2 variants for touchless smartwatch payments in stores. However, because of the security features of Samsung Pay, you will only be able to use Samsung Pay with your Gear S2 if it's paired with a Samsung smartphone with Samsung Pay set up on it. The speed and stability of Tizen on the Gear S2 was great, but I had issues with both the Gear S2 and S2 Classic constantly dropping their connection to my phone. During the week I had to factory reset it several times just to get the device to pair with my phone again, because it wouldn't do it on its own. Even trying to force it through the Gear app didn't work. This is a huge problem. Our other Gear S2 also dropped out regularly, but it did at least reconnect with the phone. The Gear S2 won't automatically connect to Wi-Fi networks if you have them set up on your phone. Depending on your perspective, this could be a good thing, given that Wi-Fi chews through more battery than a Bluetooth pairing, but having to always manually connect to Wi-Fi is a pain. Setting up Wi-Fi is surprisingly easy though, even with the tiny T9 keyboard that only takes up half the screen. Overall I was pleased with the performance of the Gear S2 and didn't notice any of the jitters or skipped frames you sometimes get with Android Wear. But at least with Android Wear you get a stable connection with the phone, and if it does drop out, it pairs again easily. As it stands right now, the unreliable connection makes the Gear S2 more hassle than it's worth; you simply can't rely on it to stay paired with your phone. The Samsung Gear S2 battery is quite small at just 250 mAh, but Samsung's claims of two-day battery life are well justified. With an occasional Wi-Fi connection, I got 33 hours out of the S2 before it died. With Bluetooth only I could go anywhere from 36-40 hours (with my regular disconnections I even made 48 hours). Of course, screen brightness and the color of your watch face affect this result. I usually used a black watch face and set the brightness to five (out of 10). If you kept the screen dimmer and didn't check your watch as often as I did, then you might easily make 48 hours even when constantly paired via Bluetooth. The Gear S2 also has a power saving mode which will drop you to a grayscale watch face, kill Wi-Fi, limit performance and only let calls, notifications and messages through. If you need your watch to last for several days rather than the usual 1.5 to two, this is great, but it kills the fun of a smartwatch, just like power saving modes on smartphones do. The Gear S2 comes with a nice little wireless charging cradle, similar to the one you get with the Moto 360 (2015). Interestingly, the Gear S2 charges on the new Moto 360 charging dock but I couldn't get it to work with any of my regular Qi wireless pads or cradles. Samsung has stated that it doesn't work with Qi but I've heard plenty of reports of it working on specific Qi chargers. With the Gear S2, Samsung has produced a really compelling alternative to the current crop of Android Wear smartwatches. In many ways the Gear S2 is the most appealing smartwatch we've yet seen but it has a few major issues. The first is the availability of apps. If the apps you live with aren't available on Tizen, this is not the watch for you. At least not right now. Connection stability is the other, huge issue. Both Gear S2 watches in the AndroidPIT office repeatedly dropped the connection to the paired phone (neither were Galaxy devices though). Mine wouldn't reconnect without a factory reset whereas the other would reconnect itself eventually. We spoke to Samsung and it is aware of the problem but as yet can't offer a solution. Barring this issue, Samsung has produced a technically outstanding watch. It is stable, responsive and has the best wearable interface I've come across. The combination of two buttons and a rotating bezel to control it works marvelously. Despite technically being the first of its kind for Samsung, the Gear S2 feels surprisingly accomplished. The Gear S2 has numerous excellent qualities, but deciding whether it's for you will come down to whether you're happy to use Tizen apps rather than the Google apps you may be more familiar with. A price of US$300-350 is pretty standard for a smartwatch of this caliber, but Samsung really needs to fix the connection stability problems before I'd consider buying one. It's a great watch, but I'd recommend waiting till a software patch and more apps arrive before pulling the trigger. screen turns off, even when you set the screen always on in the settings. screen goes into power saving mode when you're running, rendering it pretty unresponsive. want to change the next music track while you're on the move? best of luck. no built in gps, so pretty useless for tracking runs (the whole point of the watch to me is not having to have your phone on you, so i don't run with my phone). The biggest benefit for me of this watch is the built in mp3. I don't think the Garmin watches have this function. Well this review is pretty old obviously but I have never had any issues at all with my S2 Connecting to my LG G4 it rarely drops a connection and when I'm away from the phone and come within about 20ft it always reconnects right away on it's own. The watch is pretty freaking sweet, I Can't really justify spending the money to upgrade to a s3 though, the features are all the same, storage is the same, the only real advantage is the size of the face. I think as long as you have a phone with some balls you'll never have any connection issues with your S2 or S3. IF you have money to buy a s2 or s3 then you better have a phone with a fast processor and a lot of storage space. Also I love my G4 but wouldn't mind having a G6 or S8, LOL. MAJOR FLAW: I used this watch for 3 months before the round ring/bezel fell off. According to Samsung, it is NOT a warranty problem. This watch was not mishandled – I am a mild mannered office worker, not a jack hammer operator. So, if you wear the watch when you reach into a drawer, a refrigerator, a shelf, a car window, walk through a door, reach into any enclosed space, or allow your wrist to get close to ANY surface, you are in danger of destroying it and Samsung will NOT fix the issue with their product. The bezel CANNOT stand up to real world use. Samsung tech support, as expected, is based in a non-English speaking country. One of the times I called, the tech support agent did not understand the word “Broken.” I’ve wasted at least fruitless 2 hours on the phone with them. Good grief! I would not recommend this watch at all. Stay away and save yourself. I was using a gear s2 classic with my note 7, i exchanged my note for an iPhone and subsequently cancelled the line with the watch. I am now wanting to sell the watch and I cant get a straight answer from anyone Samsung or AT&T as to whether or not it can be reactivated on the network.... any help? I bought the Samsung Gear S2 Classic and have had it for about 2 weeks now. I think it is fantastic. I have the Samsung Note 7 and I have no connectivity issues at all. The battery lasts 2 to 3 days. I think it is so great that you can design your own watch face or download tons of free ones to customize your watch. I love the watch. I'm from Argentina and a friend in Germany gifted me a gear s2 (standard version). I've had it now for about 9 month now, 2 of which it was at the local customer support service. It had a minor black spot on the display and the bands tore apart (awful quality). The local official service for Samsung was not able to get the spare parts for repairing the unit (ridiculous). I don't know how you can give it a 4 out of 5 star review if the connectivity issues are so bad? Also, I would really love to know if these issues persist with the latest Samsung S7 or Note 7. Tizen app store is a crippled dwarf.. I just returned my gear s2 sport to Best Buy. After owning it 8 days the watch totally froze on me. Up to that point it was okay, but as noted very weak on apps. I was starting to like it, but not love it. The factory installed weather app started to lose its mind this morning. Several restarts later the watch froze completely and would not respond to pressing any buttons or swipes or bezel rotation. I tried for 30 minutes to do something but all to no avail. I packed it back in its little round box and with receipt in hand returned it. When I arrived at the store of course it had now apparently returned to normal status. The rep reset it to factory settings but I had already decided it was too unreliable to get another one. I had applied a screen protector which apparently fell off (unknown to me). So they would not refund me the $12 I paid for it. That was enough to make me walk out of the store and not even look at other brands. And... nevertheless, this watch is just awesome ! elegant, pratcical, and cool. My Gear S2 watch band broke, apparently glued? Best Buy has none in stock, the Samsung store (!) has none in stock, says you have to leave your watch for service and then wait 2-3 weeks. unacceptable. After what seemed like countless hours with tech support(6 hours to be exact), visiting best buy, and sitting on hold for another hour with ECR Samsung support it was determined my Samsung Gear S2 was not covered under warranty for water damage. The watch is water resistant up to 1 meter for 30 min. Samsung is saying I submerged the watch for that long and somehow it failed. The watch was never wet for that long and never exceeded that spec. Been a Samsung customer for a long time(Note 3, Note 4, currently Note 5). I doubt I would be having this experience with an Apple watch. I'm done with Samsung. Done. Good Luck with that warranty requests on your S7. My speaker has failed from just washing my hands. Same deal. What kind of crap watch are they selling here if you can't even wash your hands with it. File suit in Small Claims Court. That'll get their attention. Samsung has badly disappointed me this time. It is due to cheap exterior of Samsung S2 Gear, which I bought just two months back. I've no complains about OS, battery etc. but there is even a bigger flaw in the watch. It is the cheap coating of the watch. The black coating on my watch has started wearing away in just 2 months. Wearing and scratches on the watch coating has revealed the inner metal of the watch, which looks ugly and worn-out. Never expected Samsung to fool its customers like this. Purchased a Samsung Gear S2 watch last week as a present for a family member only to discover that it was incompatible with every phone we had available. Purchased a Samsung Galaxy J1 2016 (SM-J120F) phone today, based on the limited information I was able to find that indicated that it was compatible with the watch, only to find that this phone is also not compatible with this watch. The entire experience has been incredibly frustrating, a complete waste of money and the complete opposite of my iPhone/iWatch experience. My suggestion, avoid Samsung at all costs. To remind everyone with a negative and or disgruntled comment, please read below. Did any of you actually read the full review? Or just the bad parts? "Despite technically being the first of its kind for Samsung, the Gear S2 feels surprisingly accomplished." That is directly from the review above. And honestly, they did a pretty awesome job. I've had mine for months now, and no problems. Wanna know why?! Simply because I'm smarter than the device and KNOW not to expect miracles. The expectation of perfection with an innovative product is just down right dumb. Crying that they won't replace a band under warranty? Really?! You have 1,000's of selections, all under $10. If you can't afford the 10 bucks to replace the band, you shouldn't have bought a $200+ smartwatch. You whom complain about insignificant issues like these, YOU ARE WHAT IS WRONG WITH AMERICAN SOCIETY. Please leave comments, I am VERY interested in rebutles. I really like my Gear S2 3G as well. Once I got used to the quirks, nothing but smooth sailing. Quirk 1: One thing they don't tell you openly is that even though you CAN use it with other phones, Samsung or not, you will NOT have access to the same apps (like Uber) as you would if you used a Samsung phone. Quirk 2: Reactivation lock - if you lock it to a particular phone and then that phone dies, there is nothing you can do at that point to reset the watch (in order to pair it to another phone) except send it to Samsung for service. Fortunately, my carrier sent me a new replacement watch instead so I didn't have to do that.